Our friend Crystal P. submitted a bunch of gorgeous project photos to share! 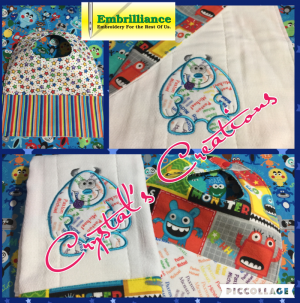 Embellishing items for children is a very popular use of sewing and embroidery. 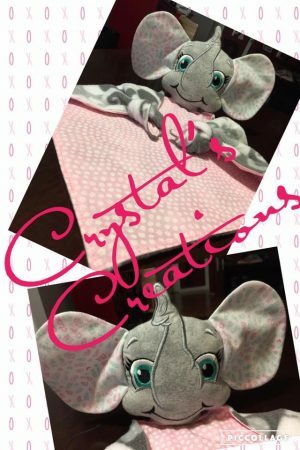 She has made these items very personal not only by customizing the embroidery designs using Embrilliance Essentials, but also by using one of a kind fabric that she purchased from Name Fabric by Lisa Bee. The monster applique design is from Designs by JuJu – the colors in the name fabric coordinate with the other fun fabrics used to make the bib and burp cloth. 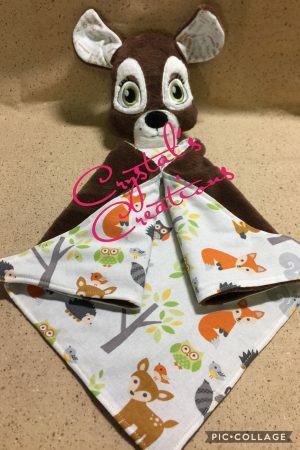 These two Lovie projects also use the name fabric in the ears. Changing colors and resizing designs in Essentials is so easy – its nice to spend more time stitching at the machine to create such fun projects. These designs are from My Petite Fleur. If you would like to see your project featured in our projects blog, you can send us pictures and information about it using this link. Posted 1 year, 10 months ago at 12:05 pm. "Thanks for all your help. I have never experienced such good support service."